Your sixth wedding anniversary is a memorable occasion that signifies the beauty in your relationship. Celebrate with a beautiful set of flowers for your sixth anniversary. For the sixth anniversary flowers, it is common to send a big beautiful bouquet of white calla lilies. The elegance of these flowers are a reflection of the elegance in your relationship. The calla lily flower is a beautiful flower which represents everything a sixth anniversary is. The most popular color of this flower to send it white. This flower symbolizes beauty and magnificence. This is reason enough to send on this special day. Let her know that this flower represents everything she is. White is a color symbolic of purity. This flower is perfect for wedding bouquets because the flower’s bold appearance stands out and the color represents purity of thought, which is very appropriate for that special day. Sending your loved one these flowers for your sixth anniversary will let her know your see she is every bit as special as she was on your wedding day. This beautiful flower is native to Southern Africa, the African island of Madagascar, and Malawi. The popularity of the calla lily is worldwide now. In ancient Rome, this flower was exceptionally popular. Since the flowers is a representation of purity and celebration, it was most often used in weddings. What is so unique about this flower is it is not a member of the call or lily family at all. It actually belongs to the genus Zantedeschia family, which is a flower family native to Southern Africa. 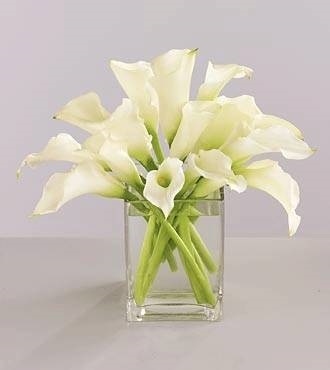 A fresh and full bouquet of beautiful white calla lilies is the perfect gift to send on this special occasion. It is the most elegant and appropriate selection of flowers for your sixth anniversary!